Wilton, CT – November 20, 2018. 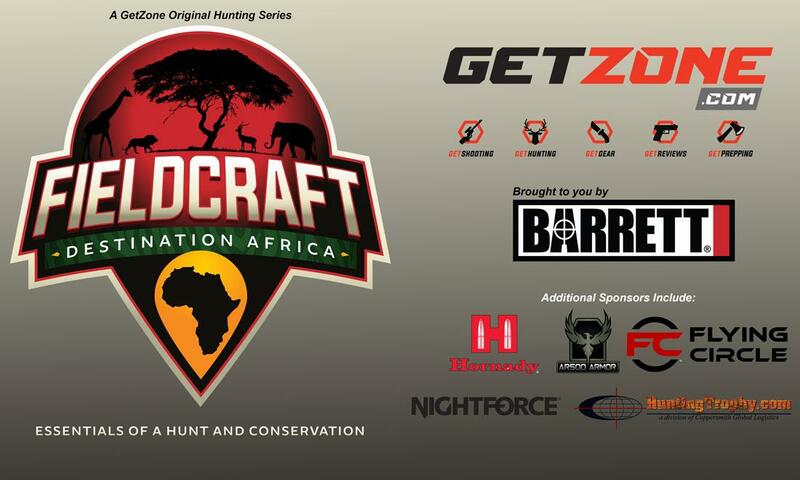 Media Lodge, the leading full-service outdoors content production studio and digital distribution platform, is proud to announce the launch of new Original Hunting Video Series Fieldcraft: Destination Africa, now streaming on GetZone.com and across the GunUp Digital Network, and shared with 4 million social media followers and 3+ million email subscribers. This 5-episode series explores how the hunt of a lifetime CAN be within reach for the average hunter. Filmed in Kimberly, South Africa, Fieldcraft: Destination Africa breaks down the planning, preparation and thrill of the hunt while also showing that hunting is essential to the livelihood of many African villages. Millions of wild animals live on private land and exist solely due to dollars that hunters contribute to the economy. Through the stories of these villagers, Fieldcraft: Destination Africa will illustrate that without hunters there would be no wild game in South Africa. Our hunters will head into the Plains with the Barrett Fieldcraft, the company’s line of lightweight rifles designed to provide maximum accuracy in a package optimized for each specific caliber. Introduced in 2016, the Fieldcraft is a representation of the company’s philosophy to build the highest performance rifles for every application. Billed as the ultimate hunting rifle, each Fieldcraft is designed to be as light as possible for its specific caliber to allow the rifle to be carried further and longer in the field. It features a carbon fiber and Kevlar stock design with a high strength-to-weight ratio and stiff construction to properly support the action and barrel, while remaining comfortable to shoot even with heavy recoiling calibers. View full rifle review of the Barrett Fieldcraft on GetZone.com. Additional Sponsors include Flying Circle Gear, AR500 Armor, HuntingTrophy.com, Hornady Manufacturing, and Nightforce Optics. Barrett is a family-owned and operated company and the world leader in large-caliber, long-distance, precision rifle design and manufacturing. Barrett products are used by civilians, sport shooters, law enforcement agencies, the United States military and more than 73 State Department approved countries around the world. Born on a ranch in Boerne, Texas, Flying Circle Gear has been designing and manufacturing field, tactical, and travel bags for the U.S. Military for more than 30 years. The company has achieved a reputation for quality and durability in the products they produce, including military specialty bags, Tactical iPad® Covers, business backpacks, laptop briefcases, duffels, toiletry bags, and travel kits. On Duty. Off Duty. We’ve Got You Covered® at Flying Circle. AR500 Armor® is an industry leading Body Armor Manufacturer specializing in affordable and reliable body armor solutions. We’ve stayed true to our philosophy oftop quality manufacturing processes and affordability since day one, and intend to continue offering the highest quality armor solutions in the industry. “Ten bullets through one hole” is the philosophy that brought Hornady® Manufacturing from a two-man operation in 1949, to a world-leading innovator of bullet, ammunition, reloading tool and accessory design and manufacture today. Rugged. Reliable. Repeatable.™ You Cannot buy a Higher Quality Scope. That’s a strong claim, without a doubt. But, it’s a claim we can prove. And our customers do prove it… every day, under some of the harshest, most unforgiving conditions on Earth. GetZone.com has grown into one of the largest video platforms dedicated to the outdoors. Partnered with the outdoor industry’s top video content creators, GetZone.com delivers the best outdoor content in hunting, firearms, and the shooting sports. In addition to content, GetZone.com offers social feedback functionality moderated by users, thus providing the firearms community a trustworthy place to communicate. GetZone.com promotes safe shooting, encourages responsible firearms ownership, and supports wildlife conservation across the globe. GetZone.com is also home to several original video series such as Ruger’s American New Shooter Academy, USA Shooting Presented by 4Outdoors, American Nomads, Ruger Range Drills (Now in its 2nd Season), In the Hunt, Finding Fearless (Now in its 2nd Season), The Good Fight, 2018 New Gear and Guns, Sootch00 Christmas Buyer’s Guides, Shooting Sports Industry Influencers, and more! GetZone.com partners with the outdoor industry’s top video content creators to deliver the best in hunting, fishing, firearms, motorsports, hiking, watersports and camping. This exclusive content lives on GetZone.com as well as across the entire Media Lodge and GunUp Firearms Network. Media Lodge has assembled a unique set of assets to engage with over 40 million outdoor enthusiasts per month in authentic and powerful ways. In addition to fishing, camping, hunting, boating, and power sports, Media Lodge has built a powerful media platform that helps brands engage with enthusiasts across the best websites and exclusive, leading e-commerce engines. Additionally, Media Lodge has invested heavily to ensure partners understand their customers, research their competitors, and realize manufacturing efficiencies. For details on how Media Lodge can increase your brand’s visibility, enhance customer engagement, and drive revenues, please visit www.medialodge.com or give us a call today.